Food processing companies often need to transfer product from one machine to the next. But when a company needs a large sanitary conveyor that can still transfer small items, an innovative solution is needed. This particular transfer unit features small ½” transfers on and off of the conveyor. 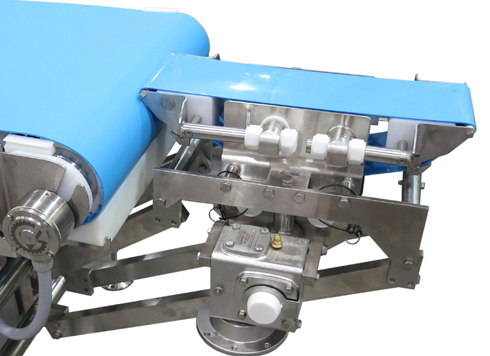 The facility that this conveyor was built for is a ready-to-eat food manufacturer with a variety of irregularly shaped and sized products. The conveyors, including the small transfer conveyor, require frequent high-pressure wash downs. This meant Dorner’s Engineered Solutions Group needed to develop a transfer conveyor that had the same level of sanitary design as the AquaPruf 7600 ULTIMATE conveyor – the main assembly conveyor of the operation. The AquaPruf ULTIMATE is the market leader in sanitary design and carries a USDA accepted equipment certification. The open and hygienic design makes the sanitation process fast and effective, with access to the inside of the conveyor available in only seconds. Learn more about Dorner’s Engineered Solutions Group and our line of Sanitary Conveyors.